Bryce Brown arrived for a news conference at the Kansas Sports Hall of Fame in Wichita on Monday afternoon wearing a Miami Hurricanes cap. He left wearing a Tennessee Volunteers cap. 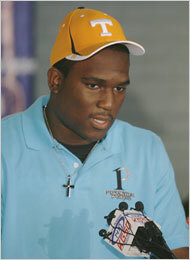 Brown, the top-rated football recruit in the class of 2009, announced that he would play for Tennessee, thus ending his turbulent recruitment. A 6-foot, 215-pound tailback from Wichita, he chose the Volunteers over Kansas State. He had also considered Louisiana State, Miami and Oregon.